1. Add soaked beans to a large pot with 5 cups of water. Add oregano, bay leaves, and sage. Bring the beans to a boil and reduce heat to a simmer. Cook until the beans are soft, but not quite done. Mine took an hour but I’ve had other black beans take much longer. 2. Meanwhile, heat a frypan on medium heat and add olive oil. Add the onion and bell pepper and saute until soft, approximately 10 minutes. Add chile flakes, smoked paprika, cumin, and garlic. Stir until spices are fragrant, around 1 minute. Remove from heat and set aside until the beans are ready. 3. Once the beans are ready, remove and discard the bay leaves, stems of oregano, and sage leaves from the pot of beans. Remove (but reserve and set aside) extra cooking liquid until there is about 1/2-inch of liquid above beans. 4. Add the onion mixture and salt to the pot of beans. Cook another hour or so until thickened and your desired amount (or lack of) soupiness. Add reserved liquid if needed. 5. Add the orange zest and half of the orange juice, and simmer. Taste and adjust chili heat at this point, add more heat to taste. 6. If adding spinach, add to pot while still simmering. Cover with lid and allow the spinach to wilt, around 3-4 minutes. Stir into the beans. 7. Just before serving, add remaining orange juice, lime juice, and vinegar. Add salt to taste. Garnish with chopped fresh cilantro. Serve with or in your favourite Mexican foods (tostadas, tacos, burritos) or just with tortillas, rice and salsa. You had me at spicy citrus. And yay! So glad you and Rob won’t be homeless!!!! That’s too bad you have to compromise like that (location vs. house), but we do the same thing in ATL. At least you’re getting a great space AND this delicious salad out of it. Great idea with the citrus. I love what that does to add more dept to spicy dishes. Congratulations on your new location–sounds like it has a lot going for it. Dishwasher…sigh…I live in Mexico and don’t have one, though some do, of course. Love the recipe–the touch of green from the spinach is inspired, plus healthy! Wow this sounds so good! What a light, spring-like way to make beans! Good luck with your move! 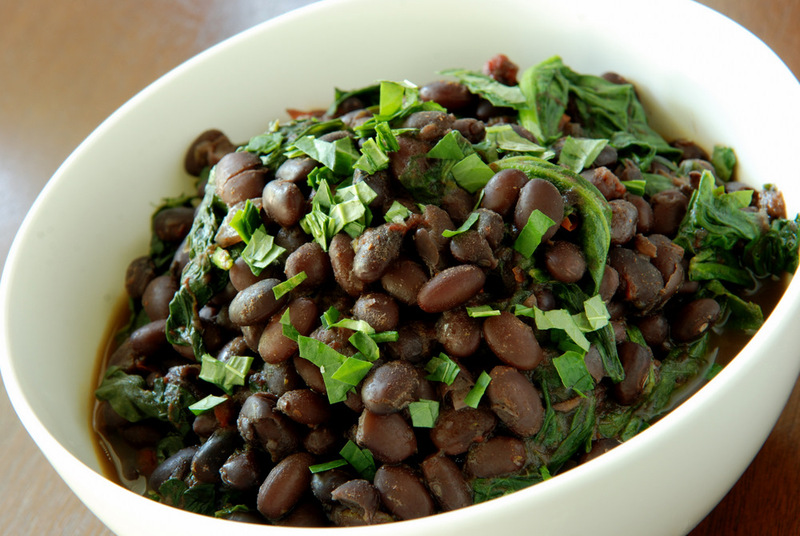 This beans and greens dish sounds it fits the bill for a nice healthy hearty dinner. Yay for finding a new place and not being homeless! Sounds awesome. I’m so excited for you guys! I definitely need to start cooking some more of my beans also…they are taking over! Happy New Home! Yeah, it’s one of life’s greatest stresses, but it’s also so exciting. (And I do know what space dried beans take up. LOL!) Thanks, Janet, for taking the time to fit in this tasty recipe for MLLA 46. I haven’t made anything Latin in a while; now my mouth is watering. 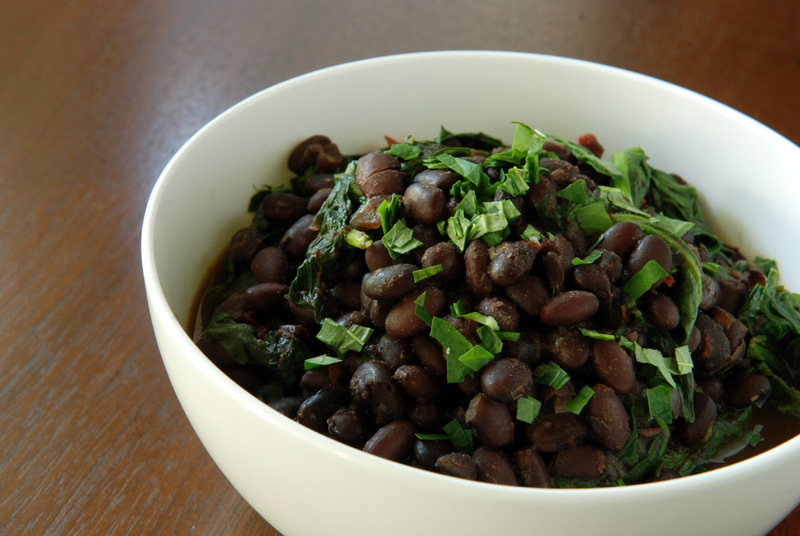 Sounds really delicious – and it could be another way for me to experiment with black beans!